← The Monday Treat – Green Velvet Cakes in anticipation of St Patrick’s Day. There are nights when a Guinness seems like a good idea. And there is nothing in the world that goes so well with a Guinness than colcannon cakes. Colcannon is a traditional Irish food – a mixture of mash potato and cabbage. Slightly fancier; add scallion and parsley. For all out perfection? Add shards of crispy bacon. Served with a poached egg, this is a pretty heartening supper. But there is one thing better than a plate of colcannon to eat with a Guinness. And that involves crossing colcannon with Boxty (a smooth potato cake) to make colcannon cakes, fried in foaming golden butter. My Grandmother was a firm believer in potato cakes when I was growing up. Both in their unadulterated and mixed in with vegetable forms. She’d eyeball flour into the potato mixture, until she could roll out the dough, then she would cut off vaguely triangular shapes with a knife and drop them into the frying pan as she went along. She was a one woman production line. Out of the pan, into my waiting mouth. Sometimes I make small cakes for a party – they can be made in advance and baked in a 400 oven for about 10 mins to warm through. I brush each one with butter just before serving. And hand round lots of napkins. 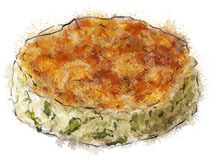 Mix the chopped scallion, the bacon and the cabbage into the mashed potato – you have colcannon! 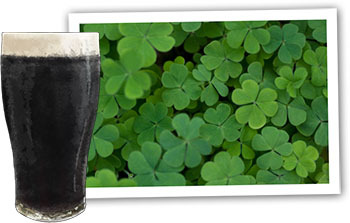 This entry was posted in The Wednesday Tipple and tagged cabbage, colcannon, guinness, parsley, poached egg, potato, scallion, st patrick's day, vegetarian. Bookmark the permalink. so excited to make these tomorrow and add our leftover salmon from tonight’s dinner. was also thinking they would taste good with a poached egg and a strip of bacon, but maybe too much bacon then? or wait, is there such a thing? Salmon and bacon are a great combo. Adding poached egg sounds like a good idea. Bacon is awesome. I don’t think it’s over kill at all! Hope you have a great dinner!